WINNIPEG – Whether an extra day in February paved the way for a record month is debatable as the best previous high for this month was 797 in 2007 and there were only 28 days to reach that level. What it does show however, is more buyers came out of the woodwork to take advantage of some of the best supply of affordable house prices in the country. Another February milestone was set thi s year too with dollar volume easily surpassing $200 million for the first time. New listings coming on to the market were up in double-digits as well however the stronger conversion of listings to sales kept the overall inventory close to where it was a year ago. Based on the strong sales activity in February and a high influx of new listings there is roughly four and one-half month’s supply of MLS® listings available going into March. It was near six months at the end of January. 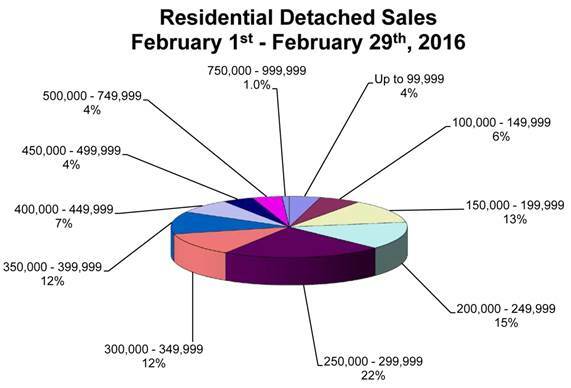 In percentage terms, February MLS® sales of 816 increased 21% compared to February 2015. February MLS® dollar volume of $222 million was up 29% over the same month last year. New listings coming onto the market in February vaulted ahead by 14% leaving an inventory of over 3,700 MLS® listings at the end of February, only 2% more than last year at this time. Given February’s impressive result, year-to-date sales and dollar volume are up 10 and 14% respectively. Listings entered on the MLS® for the first two months have increased nearly 6%. One noticeable trend which has emerged in the last few years is rural sales are gaining at the expense of the City of Winnipeg. One out of every four MLS® home sales in 2015 were in the outlying rural municipalities. 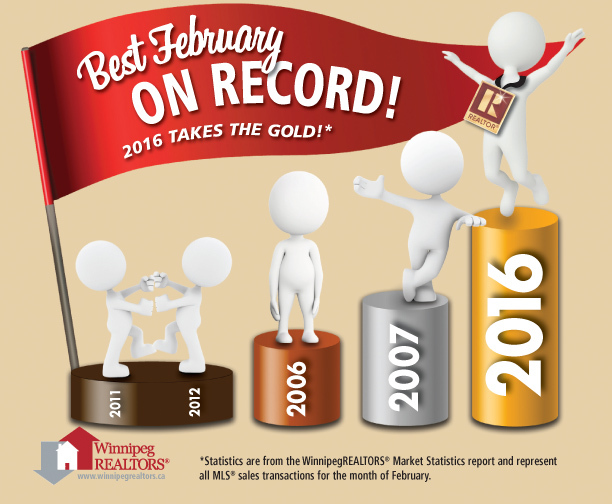 February 2016 was no exception as 28% of all home sales happened outside the City of Winnipeg. “In light of the current City of Winnipeg budget deliberations where Winnipeggers are seeing not only property tax increases but a proposed 25% increase in their frontage levy, talk of well beyond inflation jumps in quarterly water and sewer rates and a significant increase in combined building permit fees, it should not be lost on our civic politicians that outlying rural municipalities are an option for buyers seeking lower operating costs of owning a home,” said Elston. As mentioned in the 2016 forecast for Winnipeg’s MLS® market the very balanced market conditions will continue to keep a lid on pricing and this was borne out in February. Both the residential-detached and condominium average sale prices were very close to the 2015 year-end numbers. Residential-detached was almost identical at a little over $294,000 while February average condominium sales price was just below the $236,000 recorded for 2015. The most active price ranges in MLS® residential-detached sales in February were between $250,000 to $299,999 and $200,000 to $249,999 with 22 and 15% respectively of total sales. The most active price range also had the lowest average days on market of 30 days. The average number of days on market to sell a home in February was 37 compared to 34 in 2015. The most active price range in condominiums was between $150,000 and $199,999 at 28% of total sales. The second busiest price range with 20% of sales was between $200,000 to $249,999. The average days on market was 48 days, the same time it took in February 2015.